The Week of the Young Child celebration at the Child Development Lab includes a popular Campus Parade on Theatrical Thursday, April 27. 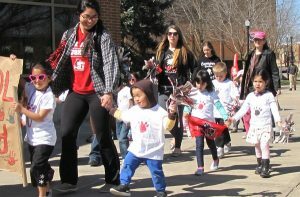 The NIU Child Development Lab (CDL) has planned several fun events to celebrate the National Association for the Education of Young Children’s (NAEYC) Week of the Young Child 2017, April 23-29. Planned events during this week include campus guest readers; a dance party for children and parents on Music Monday; Zumba on Work-Out Wednesday and the CDL Campus Parade around 10:30 a.m. on Theatrical Thursday. The CDL Parade has been a favorite tradition for the children, parents and staff for several years. Parents, teachers, caregivers and other adults play important roles in the lives of young children. Week of the Young Child celebrates their efforts. You can also celebrate this week by thanking an early childhood teacher and others who work to make a difference for children, learning more about issues affecting young children and their families, recognizing the needs of families, and adopt family-friendly policies and practices. For more information, call 815-753-1150 or email dwhite6@niu.edu.